Palm Sunday is intense. Its Scripture readings move us from triumph to tragedy, friendship to betrayal, community to isolation. Through the course of events that transpire, things shift quickly and drastically. One minute Jesus is celebrated with a parade and a dinner party, and the next he’s betrayed, arrested, deserted, and executed. One minute the crowd is chanting, “Blessed is the king!” and the next they’re screaming, “Crucify him!” The change in temperature feels dramatic, especially during a Catholic liturgy, as we act it out – entering the procession, waving our palms and singing, and, later, crying, “Crucify him!” We kneel in sorrow when he dies. How fickle a crowd can be. How fickle life can be as a moment of joy downshifts to sorrow. Or crisis. Or confusion. Not only do the crowds change tone as circumstances shift, but those closest to Jesus move from celebrating with him to hurting him profoundly. Peter declares his love but later denies him. He and the other disciples party with him all night and then sleep through his hour of need. They act out of fear and grief, not intentional desertion, but still. How hurtful. And how familiar. These kinds of inadvertent hurts happen all the time in relationships, don’t they? I sometimes act out of fear or insecurity or selfishness and wound someone I love. Or, a loved one, out of their woundedness, hurts me. It doesn’t feel good, but it’s not deliberate, and it’s what we flawed humans do. The other kind of hurt we encounter in the Gospel, though, is something else. Betrayal. That kiss from Judas is known as one of the greatest acts of treachery of all time, and I can see why. A kiss is an imitate gesture, a face-to-face expression of love and tenderness. To kiss someone, you have to lean in close to them and look them in the eyes. And Judas uses that tender expression of affection to send Jesus to his death. Some people interpret Judas’ actions as more misguided than out-and-out betrayal. Maybe he didn’t know what the religious leaders intended. Maybe he thought his actions would propel Jesus into action, into glory, and into liberating people from Roman rule. It’s hard to imagine someone so close to Jesus destroying him on purpose, but I’m probably naïve. People do that to each other. Betrayal is deliberate. Maybe it, too, comes from a person’s unresolved woundedness, but because it’s done on purpose, it’s harder to heal from, at least for me. And betrayal can only come from someone we love and trust. Whether it’s a friend mudslinging behind your back, infidelity in a committed relationship, or abuse at the hands of a caretaker, betrayal is shockingly painful, a punch to the gut that knocks the wind out of us. We don’t expect it from someone we trust. A stranger can do mean things, but only a loved one can betray. It’s a special kind of hurt. I don’t know how to heal from that except by the grace of God. Maybe that’s how we heal all things – betrayal as well as inadvertent slights – by the grace of God. All healing is a gift, and God constantly offers it to us. 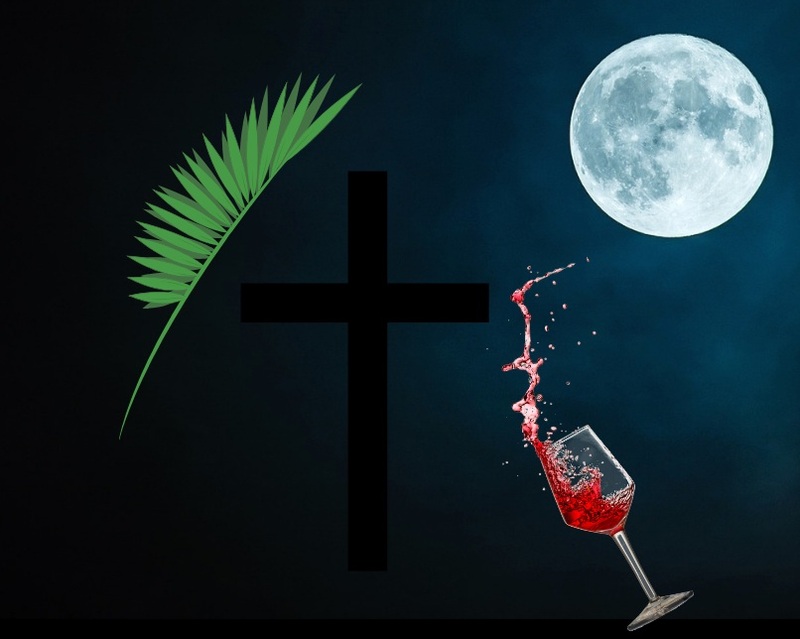 Palm Sunday is an overview of things to come this week. From now on, we’ll move through all the moments of the story, examining them from different perspectives, and going deeper into each experience. We’ll encounter the best and worst of humanity. If we open ourselves, we may suffer with Jesus. We may hurt as his experiences resonate with our own, but by uniting with him in suffering, we may also heal our pain. This week will be intense, but even so, I hope we enter in. God is in it all as we live into this holiest of weeks and the Paschal Mystery itself. Have you ever had an experience of a dramatic shift, a joy turning into a sudden sorrow? How do you catch up with it? How do you find God in it, or, do you find God in it? Have you ever been betrayed or hurt very deeply? How did you heal, and where was God in that experience? What parts of the Passion story touch you the most? What about those parts resonates with your life? What is God saying to you through the connections you make with this story and yours? What do you most hope for at this time? Where do you need new life to enter into your life? Sister Leslie Keener, CDP is the director of God Space, a community-building spirituality ministry in Cincinnati and Northern Kentucky. She’s a Sister of Divine Providence with a Masters in Ministry and a Certificate in Spiritual Direction and Retreats from Creighton University. She directs retreats, meets with people for spiritual direction, and serves as the vocation director for her community. She also serves on the Coordinating Council of Spiritual Directors International. She enjoys music, meaningful conversations, and dancing.